This deliciously indulgent recipe comes from Chef Alon Shaya as part of our partnership with the James Beard Foundation’s Taste America! Local Flavor from Coast to Coast tour. For more of our customer kefir creations, check our ebook here. This recipe consists of three parts – the crust, the almond cream and the Farmer Cheese topping. Make the crust first, followed by the cream, then the topping. The recipe is a bit time consuming, but we promise it’s worth it! For the crust: using a hand mixer or stand mixer, blend the 3/4 cup + 2 tablespoons of butter and 1/2 cup of sugar until light and fluffy (use a large bowl if using a hand mixer). In a separate bowl, combine 2 1/4 cups all-purpose flour, 1 tsp baking soda and 1/8 tsp of salt. Set aside. In a small bowl, whisk one egg, the egg yolk, 1 tsp vanilla and rum. With the mixer running on low, slowly stream the egg mixture into the butter and sugar mixture. Add the dry ingredients to the mixture and mix on low speed until fully incorporated. Wrap and refrigerate the dough for at least 2 hours. Once the dough has rested, spray a 10 inch shallow, fluted tart pan with non-stick spray. Roll the dough out to ⅛ of an inch thick and line the tart pan with the dough. Cut off any excess dough and refrigerate for 10-15 minutes. Line the prepared tart with parchment or plastic wrap and fill with any kind of raw beans. Bake the dough at 330° until lightly browned around the edges (approximately 10 minutes). Remove the beans and bake an additional 5-10 minutes until the bottom of the tart is just cooked through. Let the crust cool completely before filling with Almond Cream. For the Almond Cream: using a hand mixer or stand mixer, cream the remaining 1/2 cup of butter until smooth. Incorporating the ingredients one at a time, add 1/2 cup sugar, 2 eggs, 1/2 teaspoon vanilla extract, and 1/2 teaspoon almond extract. In a separate bowl, sift 1/2 cup all-purpose flour and 1/2 cup almond flour. Slowing add to the butter mixture until just combined. Spread cream over prepared crust and top with the sliced peaches. Bake at 330° for 15-20 minutes until golden brown. 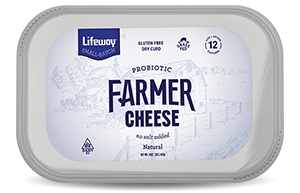 For the Farmer Cheese topping: combine the Lifeway Farmer Cheese and mascarpone cheese in a mixer on medium speed until smooth. Slowly add in 2 tablespoons raw honey, 2 tablespoons kefir, 1 drop orange blossom water and ¼ teaspoon vanilla extract. Blend until thick and smooth. Once the tart is cool, top with Farmer Cheese topping as desired. Serve and enjoy!